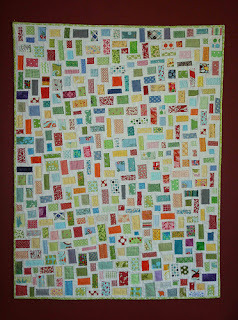 In the early days of my quilt blog reading, I kept coming across the name "crazy mom quilts" in blogrolls. And for good reason, it turns out. Amanda Jean, the writer behind the name crazy mom quilts has given quilters a wealth of information, from block tutorials and quilt-alongs to a video on freemotion quilting, all written with honesty and lots of humor. As I've gotten to know Amanda Jean better (and yippee!! I'm actually meeting her this summer in Minnesota), she was the first person I sought an opinion from about the Name Game series. 1. How did you choose the name crazy mom quilts? OK, I'll tell you...and you can laugh if you want. Some of my retreat peeps did. I was about to use a different name. A friend at the time told me flat out not to, basically saying it was lame-o. At the time it stung a bit. My husband was in agreement with my friend, which stung even more. But holy moly, were they right!!! Truthfully, when I was picking my blog name with the blogger screen open, I didn't have a good idea what to name it. I had to have a google account, so in yahoo I was typing in address names that might work...then I checked it in blogger to see if it was available. 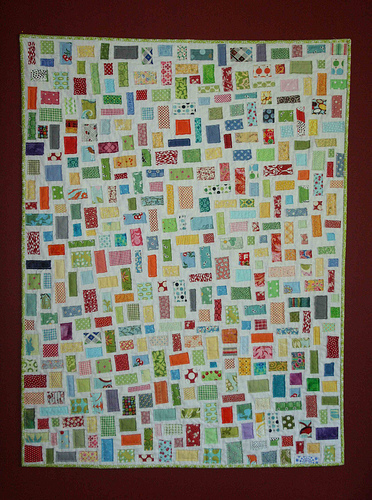 Crazy Mom Quilts was available in both, so I went with it. 2. Were there other names you considered, and can you share any of them with us? Yes, but I'd rather not divulge the specifics. :) As I mentioned, when my friend actually laughed at my first name idea, and my husband was in agreement with her, I knew it was NOT a keeper! 3. Now that you are recognized by crazy mom quilts, are you happy with it, or do you wish you could change it to something else? I hope you will all head on over to crazy mom quilts and say hi. Check out her FAQ, which contains a wealth of valuable information. Did you know that Mary is the real person behind the fabulous blog, Molly Flanders? Aren't you curious to find out who Molly Flanders is? Come back next week and find out! I really think the name Crazy Mom Quilts is a great blog name because it is so readily identifiable and easy to spell, find online, etc. I think it was a fabulous choice. Thanks for this great series! I think her name fits her too! I love this series of post! And yeh for Mary! I'll be back next week ! I love Crazy Mom! How fun Cindy! See you next week! glad your name turned out so well, and everything is happy. I'm glad to know a little more about Amanda Jean. She was one of the first ones I found when I began the blog world. I love her blog and I think it fits. 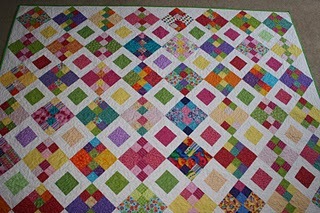 When I first started following her, she WAS a crazy lady, turning out quilts by the bushels full. I could hardly even fathom taking on ONE of those quilts and she turned them out by the dozens. I am in awe of her, and have learned much from her blog. Love your name choice. that is what made me check you out. What a great idea for a feature series ... lots of great stories to come I'll bet. This is a great idea! I am going to put you in my google reader so I don't miss any of these! I have met the famous Amanda Jean in person, and it's a very cool name for her blog! She really has grown into it. I think her family gets a kick out of calling her crazy! Thanks for sharing, ladies.